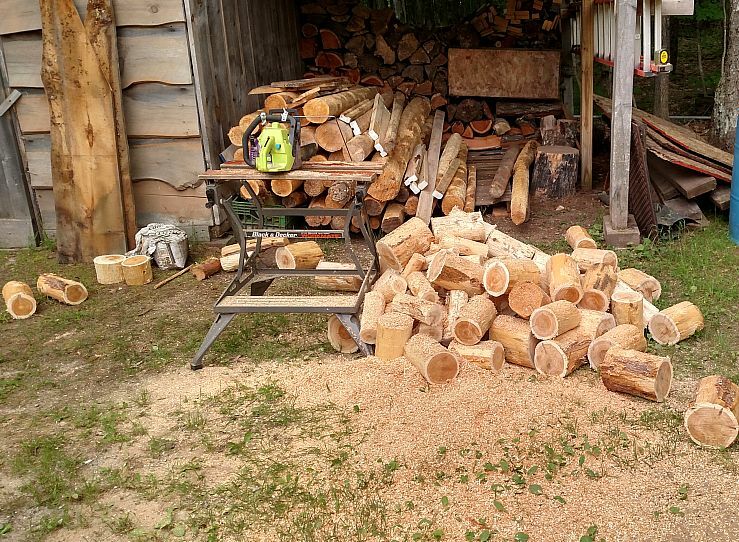 Yoopers & Finns love a good sauna! 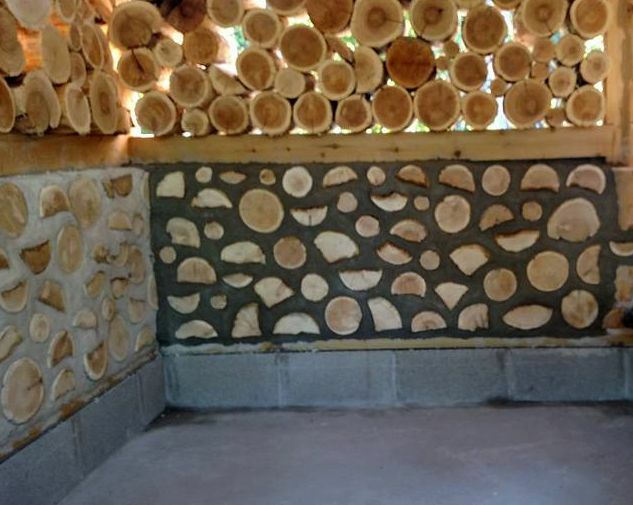 Here are photos and descriptions about the cordwood sauna that Craig Williams and Kathy Binoniemi built in Negaunee, Michigan in 2016. 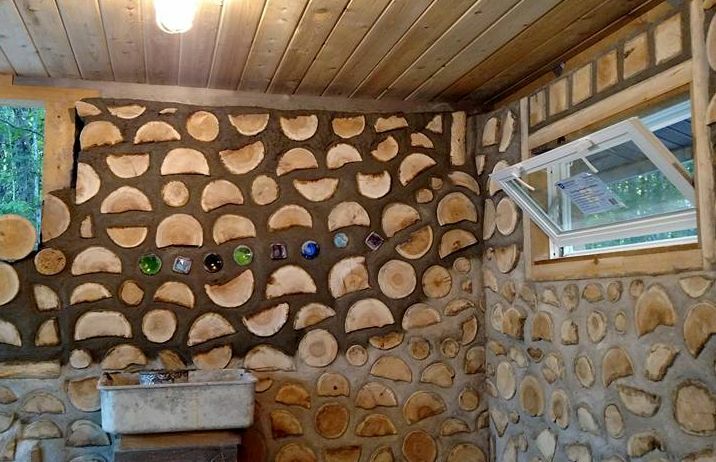 Fantastic work using best practices with cordwood. Negaunee is in the Upper Peninsula of Michigan, near the mighty Gitche Gumee (Lake Superior). It is a land of good, hearty folks, known affectionately as Yoopers. 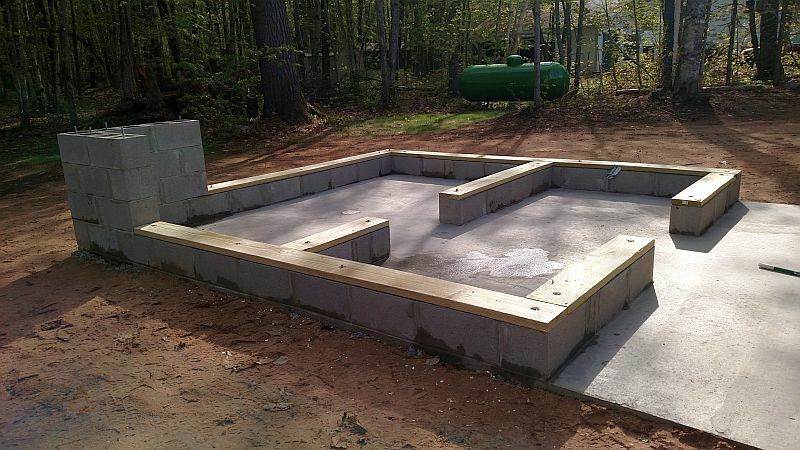 It all started with a floating concrete slab with 12” footings, which was poured on May 19th of 2016. The outer sauna dimensions are 12’ X 12’ with 2’ eaves. 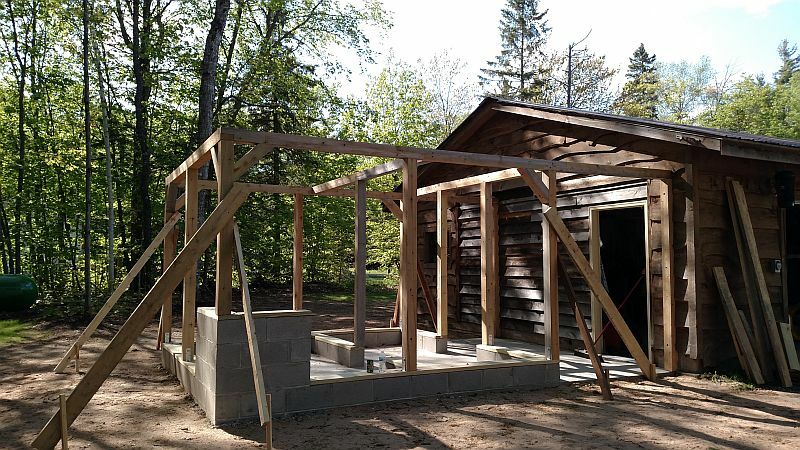 The sauna was built with 4” X 4” cedar post framing and lap joints. 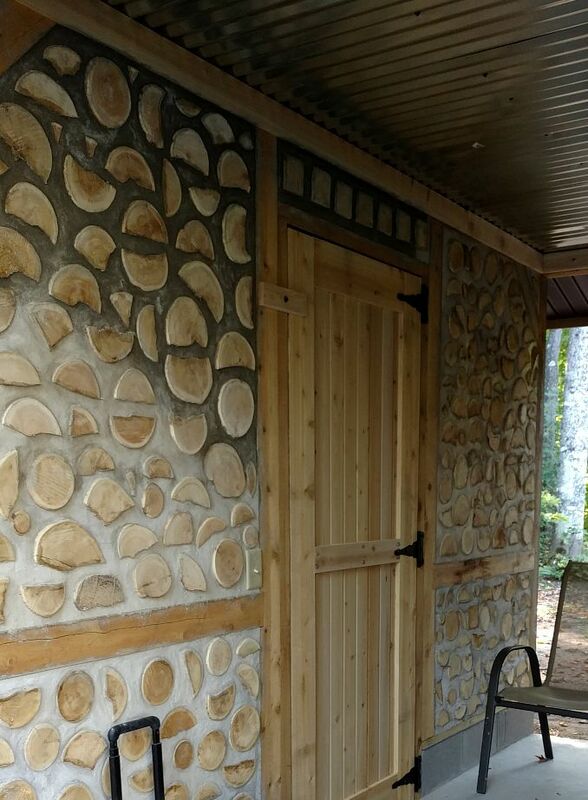 It was added to the side of the garage to make a covered walkway. 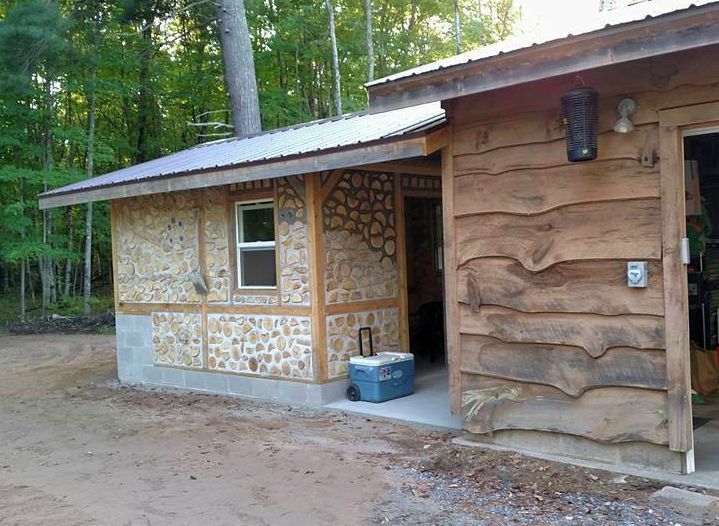 The cedar cordwood was cut to 8-9” and then, sanded. 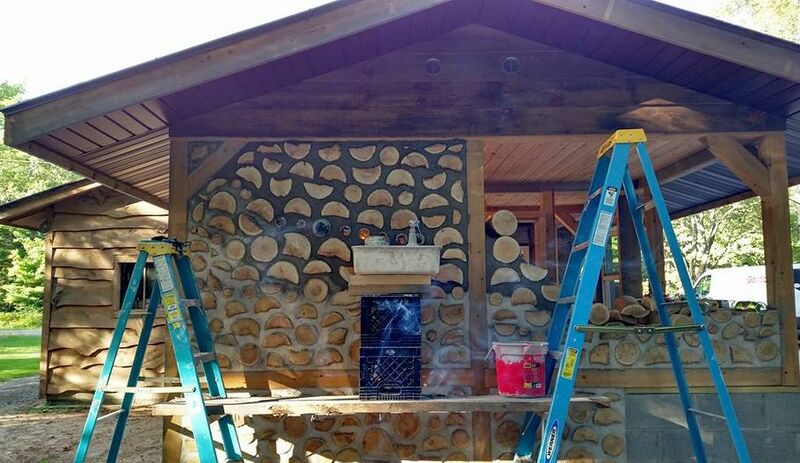 Mortar, insulation, mortar. 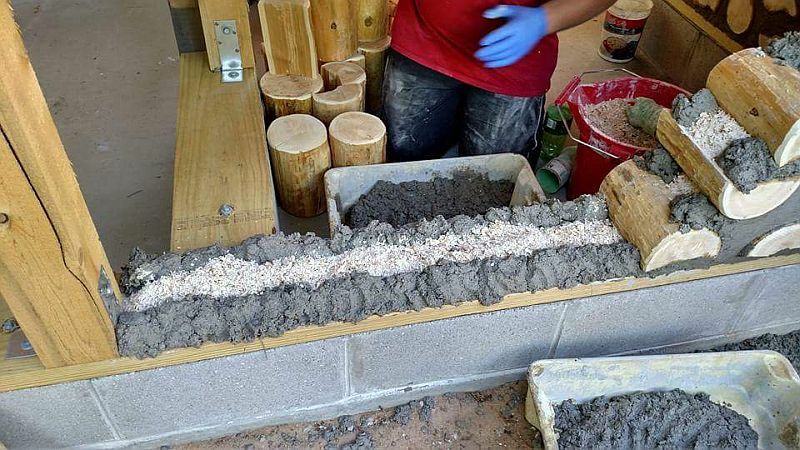 There are many different mortar mixes to use with cordwood. 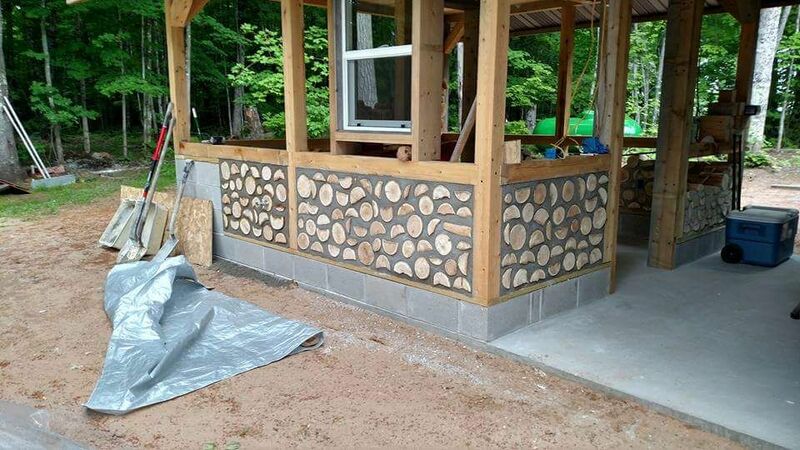 Live edge siding and cordwood look very handsome together. Kathy did some wood burning on the log end in the middle. Craig calls it “The Eagle has landed.” Very nice! 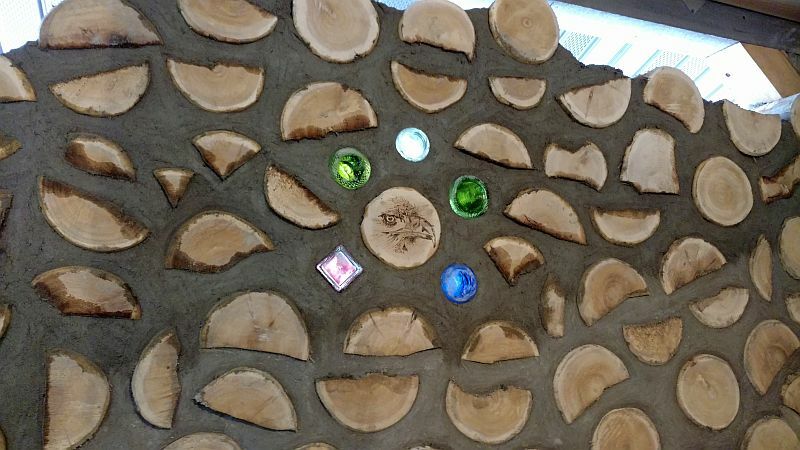 A bit of bottle brick color for the sauna takers. In the picture below, note the square blocks above the window. Note the scaffolding with ladders and the mortar box resting on a milk crate. Good ideas! 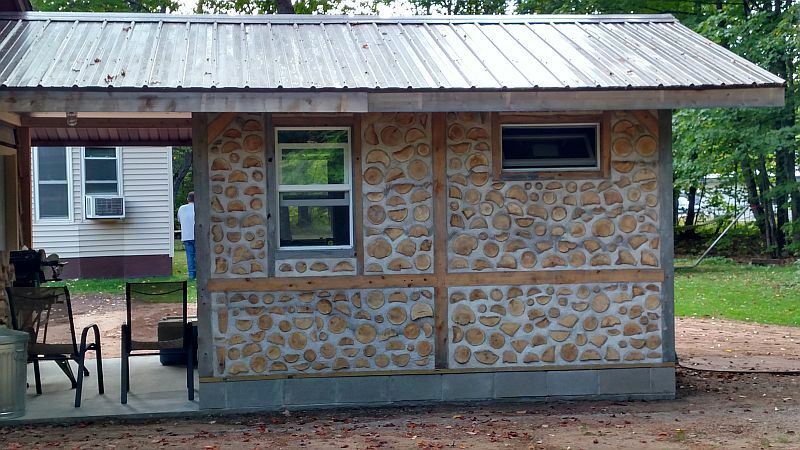 The large overhangs protect the cordwood infill. 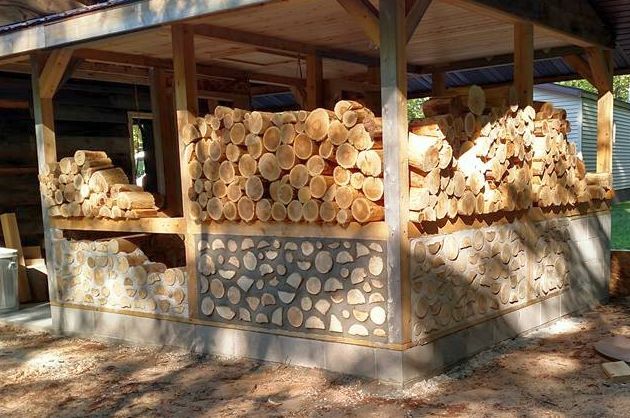 One of the great advantages of a post and beam framework, with roof attached is that you can set your cordwood in between the posts and let it get a few extra days of drying before it becomes part of your wall. 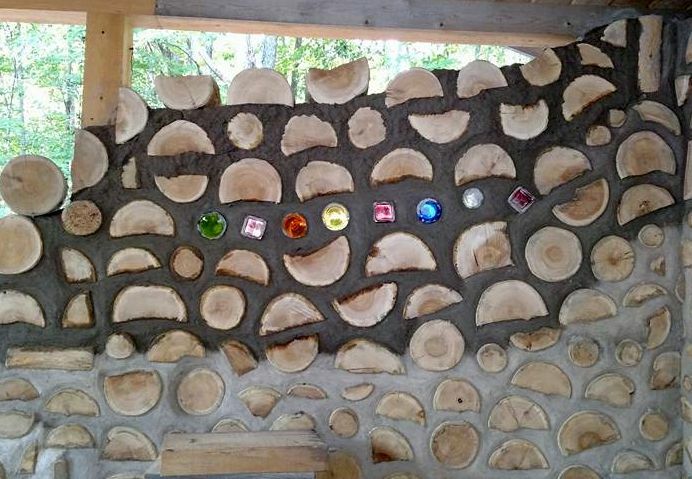 The drier the cordwood the better the result. 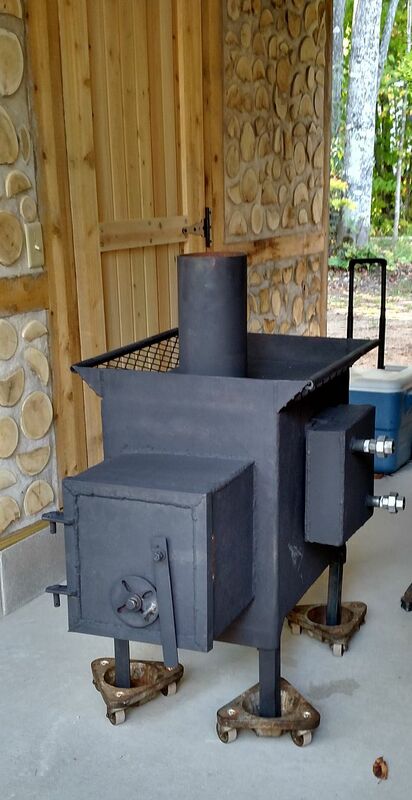 The wood sauna stove was made out of 3/8” steel plate. It was custom made by Kathy and her brother Todd Binoniemi. The finished dimensions: 19” wide, 21” long & 24” high and has an outside feed. The metal roof helps to shed the heavy snows in the Upper Peninsula of Michigan. The changing room measures 5’ X 10’ (approx.) and the sauna room 6’ X 10’ (approx.). It took us a little over 4 months to complete. 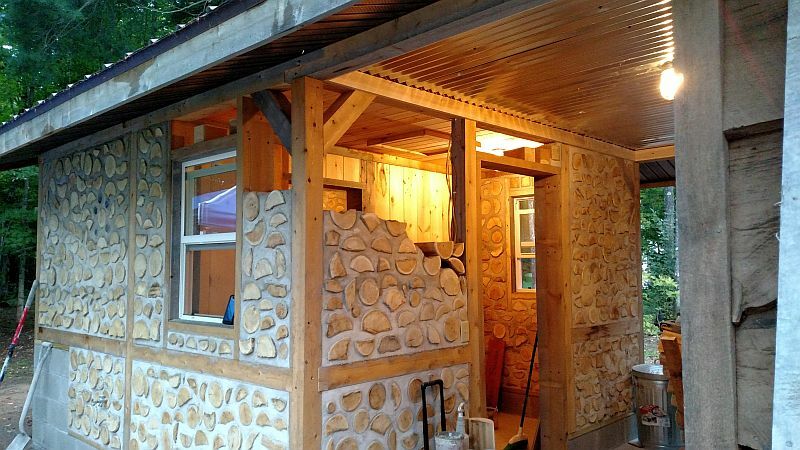 The window frames, doors (cedar), and benches (poplar) were all made by Craig & Kathy.